Pink quartz scattered at our feet, we walked up the rocky hill. Past the old tree house, criss crossing between junipers and piñons, we made our way through the golden autumn light. We had been on a hunt for piñon pine resin, or cured pine sap, found on the trunks of piñon trees, which we burn as incense. All the while gathering up the last bits of warm sun on our shoulders before the long winter in our little home in the Sangre de Cristos. Watching on our way for little sneaky prickly pears at our feet, I caught a glimpse of a round bronze shape in the sandy earth. Knowing that it looked surreptitious, I called for my children to come and uncover this treasure. 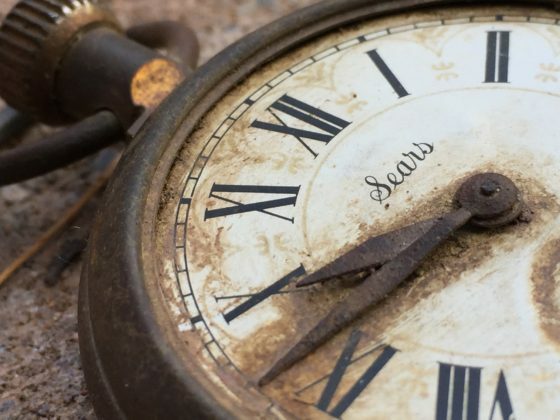 I could hardly believe my eyes when we unearthed a dirt covered rusted old pocket watch. “A treasure, a treasure! A real treasure!” we squealed. As we brushed the thick layer of dirt covering its face, beautiful Roman numerals showed themselves against a perfectly white background and delicate gold scroll work, with “Sears” branding it’s name. The hands and winding piece rusted in place, it was 9:47 when the clock stopped running. 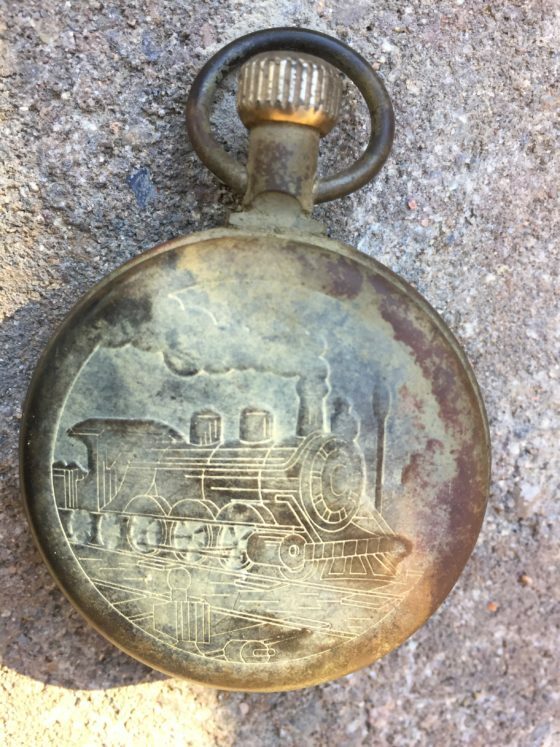 And on the back, a locomotive steam engine is engraved. Who are you old friend, we wondered? And, how did you get here? Where is your glass face that once covered your precious arms? Tell us the story about the giblets and gravy and how Uncle Mike won’t go to Christmas if there ain’t giblets in the gravy! !